Injection System Cleaner for Gasoline Engines. Thoroughly and carefully cleans injector nozzles and other fuel system elements of gasoline engines from all kinds of contaminations. Restores power and efficiency of the engine. Quickly removes all kinds of contaminations and deposits from the fuel system. Cleans inlet valves, injectors and combustion chambers. Increases reliability and efficiency of the fuel system. Extends the life span of injectors by 2–3 times. Squeeze out the contents of the tube into the fuel tank before fueling. 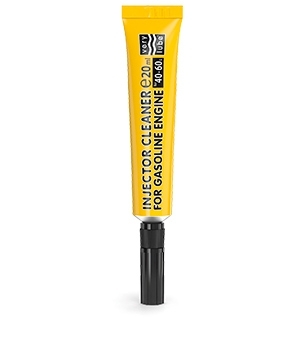 20 ml (1 tube) for 40–60 L of fuel. Compatible with all grades of fuel. Safe for catalytic converters and lambda probes.